Marinate vegetables for 15 minutes. Cook on well seasoned, medium-high grill. 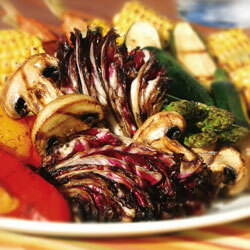 Brush with marinade while cooking, turning vegetables as needed. Vegetables are done when slightly softened and slightly charred. Tip: protect tips of radicchio leaves with aluminum foil placed on grill.